Abandoned German Nuclear Plant Transformed Into Wunderland Kalkar Amusement Park! Last month Germany announced plans to completely phase out the use of nuclear power by 2022 in favor of renewable energy sources - however what is to become of the nation's nuclear plants after they have been shut down? 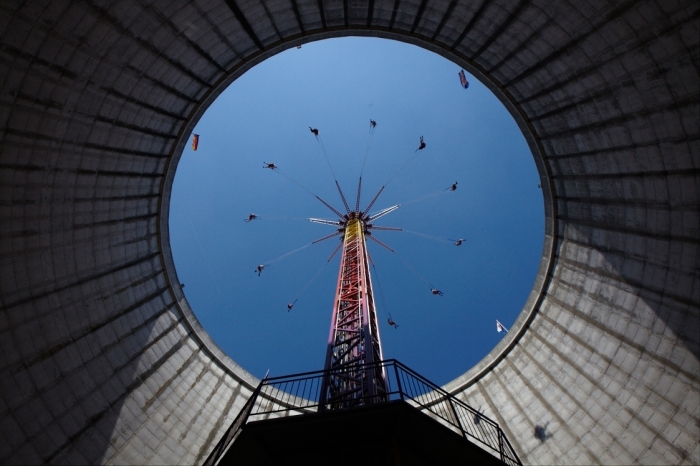 Enter West Germany's Wunderland Kalkar - an incredible adaptive reuse project that transformed a never-used nuclear reactor into an amusement park! The remarkable renovation took a power station in Kalkar and turned it into a park that attracts hundreds of thousands of visitors every year. Wunderland Kalkar hosts a range of activities and play areas for the whole family – from high-flying swings to merry-go-rounds, and a carousel. The repurposed site has worked wonders for the area’s tourism industry, attracting an average of 600,000 visitors a year. Construction of the plant began in 1972, but the project suffered continual delays due to protests of those concerned about the safety of nuclear power. The plant was eventually completed over ten years later, however it never went into operation and the estimated $4 billion project was dismantled after less than a decade. 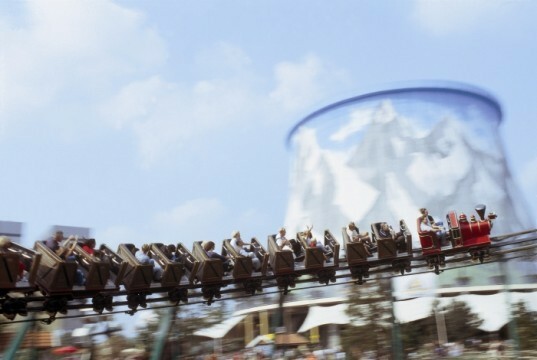 Adapted into Wunderland Kalkar in 1995, the site continues to function in its new role, attracting visitors from around the world. While no mention is made of what type the reactor was, presumably it was some version of a solid fuel reactor. While modern designs of solid fuel reactors can be safe, there is a far superior design that not only avoids the problem of waste generation, it can use present stockpiles of "nuclear Waste" as fuel, producing power and reducing the volume of waste to 1/100th, and of a type that is low level and only remains radioactive for 2-300 years instead of 20,000 years. These reactors, the LFTR/MSR (Liquid Fluoride Thorium Reactor/Molten Salt Reactor) are totally fail safe, much simpler and less expensive to build, and operate at atmospheric pressure. With no water present in the reactor they simply cannot explode. The radioactive fuel is a molten salt, so if any problem occurs, the fuel salts simply are drained into a reserve tank and all reactions stop. No operator intervention or external power is needed. The decision to retire all reactors is foolish in the extreme. The Variable nature of Solar and Wind power is already destabilizing the German power grid and necessitating the construction of fossil fuel (coal) backup generators. This is not acceptable. For more information on the LFTR/MSR see "Super Fuel" by Richard Martin, and "Thorium: Energy Cheaper Than Coal" by Robert Hargraves. I dont know Im not from Germany, Im from the US so I dont know what Germany would allow nor how advanced they are in the nucular clean ups while you trying to be smart. I do know that all is not known about contaminated soil an how long it last an how deep the contamination may go. Do you really think you can operate a theme park in Germany if there would be the slightest hint of threat for the visitors? Im not to sure bout this, I mean in 20, 40 yrs am I gonna suddenly have cancer an it be traced back to contaminated ground that they thought was taken care of? Wunderland Kalkar now hosts a range of activities and play areas for the whole family. The amusement park high-flying swings, merry-go-rounds, a carousel, and other fun activities. The repurposed site has worked wonders for the area's tourism industry, attracting an average of 600,000 visitors a year. Construction of the plant began in 1972, but the project suffered continual delays due to protests of those concerned about the safety of nuclear power. The plant was eventually completed over ten years later, and then the estimated $4 billion project was dismantled after less than a decade in operation. 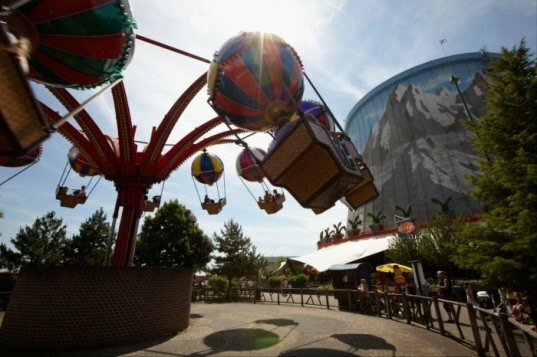 Adapted into Wunderland Kalkar in 1995, the site continues to function in its new role, attracting visitors from around the world.